If your goal is turning heads at the beach, you'll want tips on grooming and choosing flattering trunks, as well as a workout for flat abs and a pumped-up physique. Check in with your doctor if you're not active now and over 45 or have a health condition. For pecs that beg to go shirtless, start with a bench press. Lie back, with your feet flat on the floor. Hold a dumbbell in each hand at chest level. Push the weights straight up, and slowly lower back down. Start with light weights, doing 16-20 reps until you perfect your form. Go heavier slowly, so you can't do more than 8-12 reps. Aim for three sets, resting 30-90 seconds between sets. 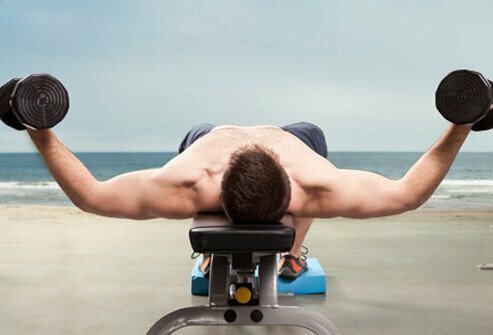 Lie on your back with a dumbbell in each hand. Raise the dumbbells above your chest, shoulder-width apart. With your palms facing each other and elbows slightly bent, inhale and lower the dumbbells in an arc to chest level. Exhale and slowly raise the dumbbells to starting position, as if wrapping your arms around a barrel. These will sculpt your shoulders, triceps, and pecs. Start in plank position with your hands under your shoulders and your legs extended behind you. Keeping your body tight and straight, bend your elbows to lower yourself until your chin or chest touches the floor. Straighten your elbows to push back up. Do 2-3 sets of as many reps as you can manage with good form. Stand gripping a barbell at thigh level. Your hands should be shoulder-width apart, palms facing forward. Exhale and bend your elbows, raising the bar to shoulder-level. Keep your elbows at your side. Inhale and slowly lower the barbell to starting position. Keep your knees slightly bent, and don't let your back arch. Sit on a bench with your back against a backrest. Keeping your arms at your sides, hold a dumbbell in each hand, palms facing forward. Exhale and slowly curl your arms up until the dumbbells nearly reach the shoulders. Inhale and lower the weights to starting position. If doing more than eight reps, rest for at least 90 seconds between sets. Buff arms require working the triceps, too. Give them some definition with barbell extensions. Lie on a bench with a barbell raised directly over your face, elbows straight and palms facing forward. Bend your elbows to lower the barbell down toward your forehead. Keep your elbows in the same place. Exhale and push back up. You can do triceps pushdowns with resistance bands or cables. Stand with your hands gripping the bands, palms facing down. Your elbows should be bent so your forearms are parallel with the floor. Keeping your elbows at your side, exhale and press down until your elbows are straight. Inhale and return to the starting position. Don't lock your elbows. Sometimes called the military press, this move sculpts the deltoid muscles in the shoulder. Sit on a bench with your back against a backrest. 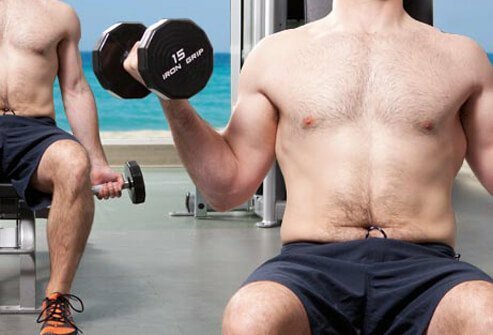 Hold your dumbbells at shoulder height and shoulder width, palms facing forward. Exhale and push the dumbbells up until your elbows are fully extended. Inhale as you slowly bring the weights back down. Stand with dumbbells or kettlebells at your sides, feet shoulder-width apart. Raise your heels until your weight is on the balls of your feet. Contract your abs to help keep your balance, and slowly lower back down. Good moves to challenge other leg muscles include squats and leg presses for your quads, as well as leg curls for your hamstrings. Your lats are broad muscles that run from mid-back to waist. You can do lat pulldowns with resistance bands or cables. With your hands wider than shoulder width, grab the bands or cable bar overhead, keeping your elbows straight. Pull the bar or bands toward your chest, bringing your elbows close to your sides. Slowly extend your elbows to raise back up. The dumbbell row works your lats as well as the rhomboid muscles in your upper back. Begin with your left hand and knee on a bench and your right foot flat on the floor. Hold a dumbbell in your right hand next to the bench. Bend your elbow and pull the dumbbell toward your waist. Lower slowly it back down. Do these instead of crunches. An American Council on Exercise study rated this move as one of the most efficient ways to tone the major ab muscles, including the rectus abdominis and obliques. While lying on your back, pedal your legs as if riding a bike. As you pedal, touch each elbow to the opposite knee. Keep your lower back pressed to the floor. For an ab exercise that doesn't involve lying on the floor, try cable rotations. Stand holding a cable close to the upper abdomen. The cable should extend to the side, not directly in front of you. Tighten your abs and slowly turn your torso away from the cable anchor. Hold briefly before returning to starting position. After one set of 8-12 reps, face the opposition direction and repeat. "Manscaping" has taken off in recent years. The most popular targets for manscaping are the back, chest, and pubic area. 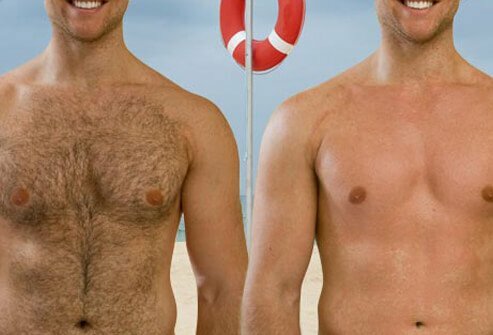 To avoid prickly stubble, waxing is a better option than shaving for large areas like the chest and back. 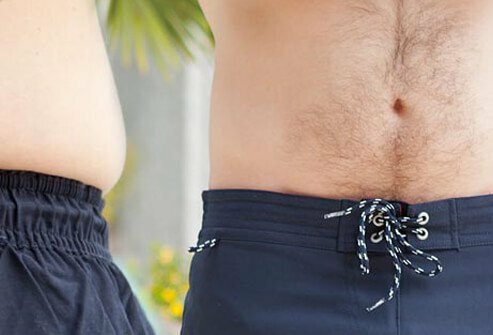 While most swim trunks are made with elastic waistbands, this style can accentuate even a little extra girth around the waist. For a more flattering and stylish option, look for shorts that close with drawstrings, snaps, or buttons. Once you've got your fitness program underway, it's time for a little fashion boot camp. Baggy, low-riding board shorts look best on men under 20. If your teenage years are behind you, consider more fitted trunks that sit just above the hips. But avoid going too tight or too high. Consider your height before picking the length of your trunks. Long trunks look right at home on tall guys, but can overwhelm shorter men. Short trunks, in contrast, can create the illusion of longer legs. Men of short to medium height should opt for short to medium-length trunks. Always wear sunscreen. Look for a broad-spectrum product with an SPF of 30 or greater. None are truly sweatproof or waterproof, but there are water-resistant types. Gels work well for hairy spots like the scalp and chest. Don't forget your ears and lips. And wear a shirt and hat for extra protection. No beach body is complete without tidy feet. When trimming your toenails, don't round the edges -- that will make them prone to getting ingrown. If you go for a professional pedicure, make sure the salon sterilizes its utensils. Don't let the technician cut your cuticles or remove dead skin with a foot razor. Once your toenails are tamed, you'll be ready for barefoot walks on the beach. To show your developing six-pack, you'll need to burn off belly fat that tends to hide the muscles underneath. You can do moderate-intensity exercise, such as brisk walking, for 30 minutes on most days of the week. Or pump up the intensity to vigorous exercise, like swimming or running, and get the same benefits in half the time. 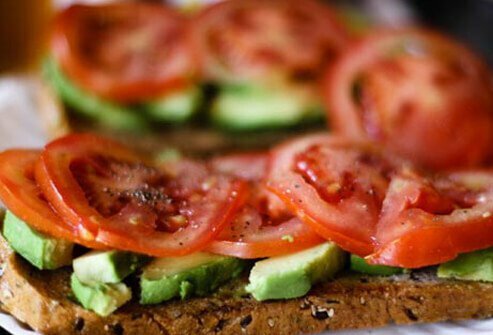 If you're trying to lose weight, you need to cut calories, but there are some foods you will want to eat more of. Filling up on a salad first at lunch or dinner can help you eat less during the rest of the meal. Adults who eat high-fiber whole grains tend to weigh less than those who opt for white, refined grains. 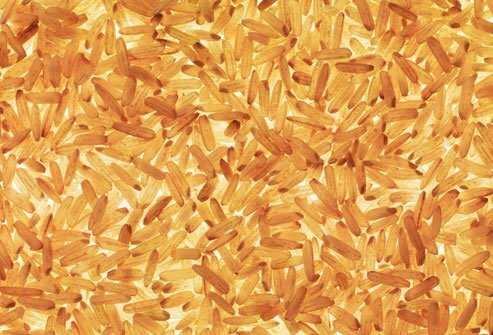 Adding more whole grains can be as simple as ordering brown rice instead of white. It's not just beer that can pad the belly. Alcohol of all kinds has empty calories that your body may store as fat -- and weakens your ability to resist a plate of super nachos. 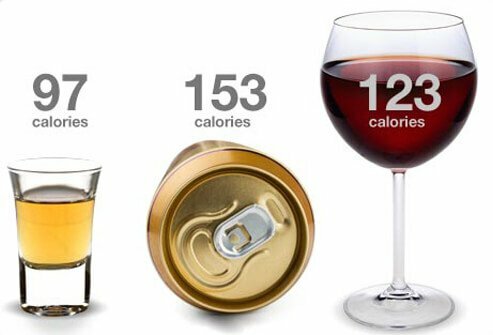 Drinking heavily, no matter the form of alcohol, is linked to weight gain. Try lower-calorie drinks, slower sipping, or alternating with no-calorie club soda. 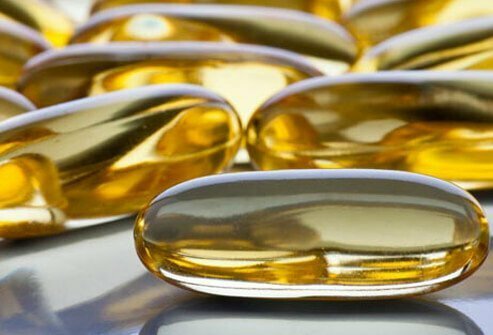 Browse the aisle of a health food shop, and you'll see many supplements hinting that they can melt fat. Few have evidence to back the claims. One exception is conjugated linoleic acid (CLA). In a study published in the British Journal of Nutrition, overweight adults who took CLA for 6 months lost more fat in their legs and waists compared to those taking a placebo. Check with your doctor before taking supplements. 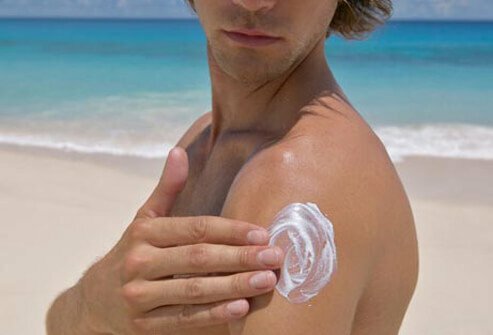 American Academy of Dermatology: "Sunscreens." American Council on Exercise: "Chest and Back Workout." American Council on Exercise: "Total Body Workout." American Council on Exercise: "Shoulders and Arms Workout." American Council on Exercise: "Lying Dumbbell Pec Fly"
American Council on Exercise: "Dumbbell Bench Press." 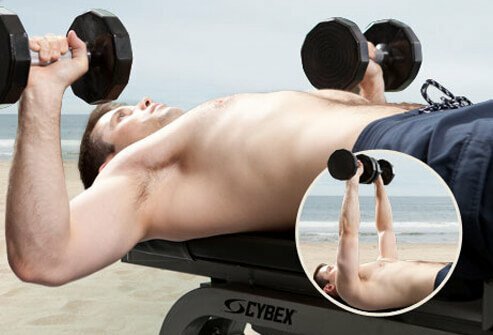 American Council on Exercise: "Dumbbell Incline Press." American Council on Exercise: "Push-Up." American Council on Exercise: "Standing Barbell Curl." American Council on Exercise: "Seated Dumbbell Bicep Curl." American Council on Exercise: "Lying Barbell Triceps Extensions"
American Council on Exercise: "Triceps Pushdown." American Council on Exercise: "Seated Dumbbell Press." American Council on Exercise: "Barbell Calf Raises." American Council on Exercise: "Lat Pulldown." American Council on Exercise: "Single Arm Dumbbell Row." ACE FitnessMatters: "New Study Puts the Crunch on Ineffective Ab Exercises." American Council on Exercise: "Supine Bicycle Crunches." American Council on Exercise: "Standing Cable Rotation." U.S. Department of Health and Human Services: "Dietary Guidelines 2010." Men's Health: "Wear This, Not That: Swimsuits." Cosmopolitan: "The New Male Grooming Obsession." Skin Cancer Foundation: "Can Sunless Tanners Cause Skin Cancer?"